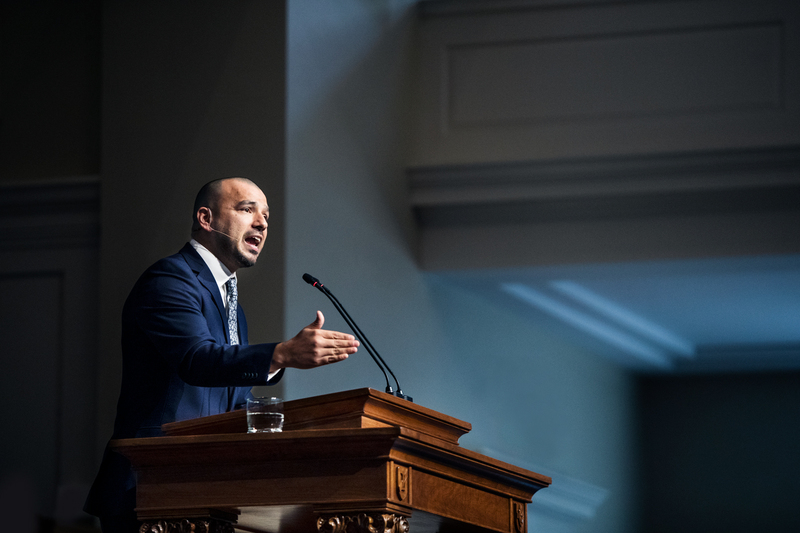 Success in ministry does not come from your abilities, but from the kindness of God, argued Noe Garcia during an Oct. 18 chapel service at The Southern Baptist Theological Seminary. Garcia is an alumnus of the seminary (doctor of ministry) and senior pastor of North Phoenix Baptist Church in Phoenix, Arizona, which was the home church of the late Senator John McCain. Garcia attracted national attention this past August when he presided over McCain’s memorial service. During his chapel message, Garcia asked seminary students to rethink the meaning of success in ministry: He urged future ministers not to look for ministry success anywhere but in God’s provision. "Your success will not come from the degrees hanging on your wall,” Garcia said. “Your success will not come from who you know. Your success will not come from your bank account. Your success will not come from your mentors. Your success will not come from your charisma. Your success will not come from anything but the Lord." Preaching from Nehemiah 1, Garcia noted that God is the main character of the story — a great and merciful God redeeming a disobedient people. Garcia also pointed out that not much is known about Nehemiah, except that God called him to do something dramatic for his sake: to lead the exiled nation of Israel back to Jerusalem and to rebuild the walls of the city. Christians should care deeply about the things God cares about, Garcia claimed, noting how Nehemiah was moved to tears because of the sin of his people. In the narrative, Israel is broken, sinful, and separated from the land God had preserved for them, and this leads Nehemiah into deep sadness, prayer, and fasting. According to Garcia, this should be the first step for any minister of God’s purposes — utter dependence upon God. Seminary graduates enter the ministry with many trained skills — in theology, exegesis, hermeneutics, and church history. But Garcia suggested these abilities do not qualify anyone for faithful ministry; only the presence and power of God can do that. The drift away from faithful allegiance to God’s name is slow, according to Garcia. But it’s easy for Christians to develop disordered priorities because the human heart is self-deceptive. Garcia told students that confession and repentance are critical components of ministering for God. And he argued that the Christian life does not only begin with repentance — the whole of the Christian life is marked by consistent repentance for sin. Audio and video of the chapel service are available at equip.sbts.edu.